Highest Performing Retail Pumps Available! The Medela is the only electric retail pump with breakthrough 2-Phase Expression® pumping for maximum milk flow. This advanced pumping pattern, with its adjustable speed and vacuum control and one-touch “let-down” button, mimics a baby’s nursing rhythm and feel. 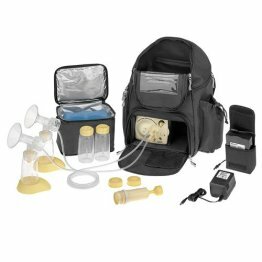 The stylish bag comes with everything you need, including the pump, the cooler carrier, a motor unit, a manual pump and container units, lids and stand, as well as the Battery Pak for nursing anywhere, anytime.